Installed in our local area of Nottingham, this GRP Composite front door really brightens up the entrance to this property. 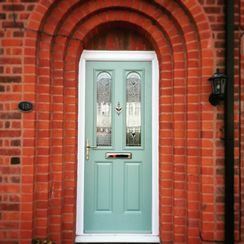 Our installation team covers all of Nottingham and the local area for internal and external door installations. Secure and draft proof composite doors are very popular with our Nottingham customers. If you are in Rushcliffe or the surrounding area email us for a survey and quotation at info@davesdoors.co.uk. This installation was quite a challenge for our fitters, however the result is well worth that little extra effort on the inside of the property. When removing the old timber door our installation team discovered there was some minor building issues that needed to be addressed on the inside of the property, as you can see from the image the attractive style of the arch way in this opening meant that a little work was needed on the hallway walls to get a good finish both inside and out. The header bricks visible from the outside were also reinstated and pointed up by our door fitting team. Many of our installations in and around Nottingham have the odd minor issue left by a previous installer however the skills and abilities of our installation team go above and beyond anything we have come across yet!